Our Blog | Premier Door Corp.
It’s no secret that garage door windows are beautiful. They amplify a home’s appeal and it’s hard not to notice as you drive past. However, have you ever wondered why your neighbors have these eye-catching garage windows? What’s the point of having them as opposed to a regular garage door? Are they a security risk? This important aspect is the “first impressions” factor. What do people see when looking at the house from the street? What conclusions will someone make when they take a good look at the house? Although curb appeal takes into account the exterior as a whole, the garage makes up a large portion of this. It’s easy to ignore the garage door. It’s a functioning part of the house that often gets overlooked, but by one simple change, it goes from being only functional to looking wonderful. Strengthening the curb appeal of your home has a lot of lasting effects. Installing a garage door window is one of the easiest ways to improve the value of your home. If you plan to sell any time soon, this one change makes all the difference. Curb appeal is a big selling point and who doesn’t want a house that looks great at all angles? Also, there’s no extra risk to your home’s security. Most windows are high enough to be out of reach for any would-be burglar. If you want to stop unwanted eyes from peeking inside, use tinted glass to keep your property private. Are you worried that your garage door doesn’t quite match the rest of your house? Does it stick out like a sore thumb? 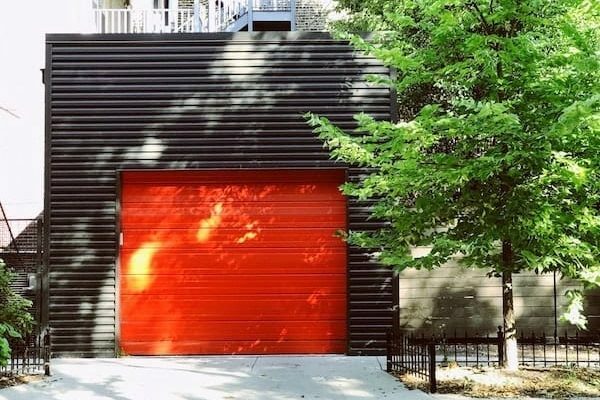 Redesigning your garage door makes this worry go away. A simple trick to get a cohesive look is to use the same shape of windows as the rest of the house. The size is often smaller, but if the shape and borders are the same, it enhances the design as a whole. Don’t let a garage door be the glaring flaw in your otherwise perfect home design. Get it up to par with the rest of your house! A garage door with windows is more than a pretty face. It also lets in natural light, giving you something better than a single bulb hanging in the center of the garage. With that extra light comes extra warmth as well. Instead of blocking out the sun’s natural warmth, windows let it come inside and heat the garage. This makes for a valuable additional heat source when winter comes around. Lower your carbon footprint by installing a set of windows into your garage. There is a certain kind of glitz and glamor to garage door windows. They make a mundane garage look high-end and classy with one simple change. If you’re looking for a way to change up your home with something that has a lot of added benefits, install a set of garage windows. The benefits listed above added to their sheer beauty makes it a great choice for any home. Don’t forget to take a look at the types of garage doors we have on offer to make your garage something spectacular! When homeowners updated their garage door, 71% of them said that they believed it increased the value of their home. If you’ve decided to renovate your home to a more modern look, you may want to look outside at your garage. When you’re ready for an update, you may find yourself debating between installing a single panel or a sectional garage door. Here are a few things to keep in mind to help make your decision easier. Sectional garage doors are very popular. These doors come in different panels and fold up and inside of itself when you open them. When you close the door, one panel goes down at a time. Single panel garage doors were very popular before sectional doors came out. This door is just one solid piece rather than divided into different sections. This takes up about as much space as the sectional garage door; it just operates differently. Before you decide which one to install, think about what appearance you are going for. This is one of the most important things to consider after the cost. Both options can work for the certain look you are going for, and they both come in different designs and materials. Older homes generally have single panel doors, giving them a different feel and a vintage aesthetic. If you have an old home, you may want to install a single panel to keep the theme consistent. Newer homes generally have sectional garage doors, making them feel more modern and contemporary. Single panel doors also don’t have the slats in them, so it can make it easier to customize how you want it to look. However, sectional garage doors are becoming more customizable as well, so if you want a sectional garage door, but have an older house, you can still achieve that vintage look with a little bit of tweaking. Before you install a new garage door, you should consider the cost. Single panel doors tend to cost a lot because they are not as frequently used, but sectional doors normally cost more to install. If the doors are made of the same material, the single panel doors may end up being cheaper. A sectional garage door may cost more to maintain later on,because you have things such as the springs and cables to maintain over time. However, if you’re going to install the door yourself, a single panel door will save you more money because there are fewer parts to install and maintain. It can be difficult to choose between a sectional garage door and a single panel door. There are pros and cons to both, so you will have to decide which aspect is most important to you. To start your garage door renovations, you can contact us here. In 2017 alone, multiple power outages left 36.7 million people in the dark. Whether it’s from stormy weather or routine maintenance, there’s nothing more frustrating than losing electricity. You can’t watch Netflix, your refrigerator is off limits, and you can’t even heat up last night’s Chinese food. However, what do you do if you need to get to your car in the garage? If you’re like most Americans, you probably rely on an electric garage door opener to operate your garage door. Let’s go over how to manually open a garage door when the power goes out, so you can escape the dark and access your car. Don’t get left in the dark; let’s get started. The average power outage usually lasts for four hours, but if you’re in the middle of your day, four hours can seem like forever. It’s likely you want to get out of the house and back into civilization, but you need your car, which is securely stuck in the garage. Let’s find out how to manually open your garage door despite your power outage. Unless it’s a sunny day, and your garage has ample natural light, you’re likely going to need a flashlight to see what you’re doing. Always keep a few around the house for these occasions. Most garage doors have a red emergency cord that will allow you to disengage the trolley operator and open your door manually. Your job now is to find it. It’s usually hanging down from the ceiling near the center rail of your garage door. It looks like a rope with a handle at the end and is often red. Pull downwards to release it from the garage door opener. Before you lift the door, locate the manual lock function, if your door has one, and ensure it’s open. Now that you’ve disengaged the door from the door opener, you should be able to lift it up from the bottom, assuming the door springs are properly balanced. This should be easy to do, regardless of the size of your garage. 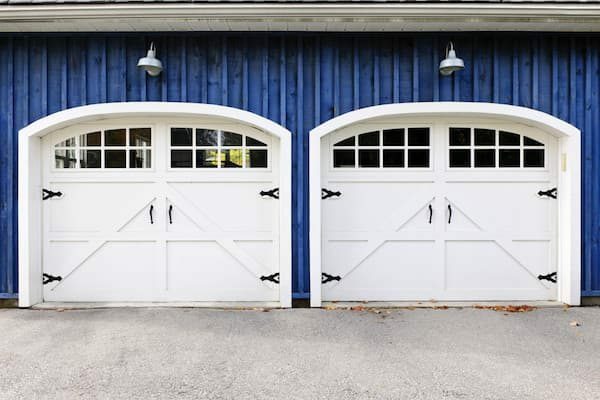 For your safety, ensure the garage door stays open and doesn’t come crashing down due to lack of spring tension. 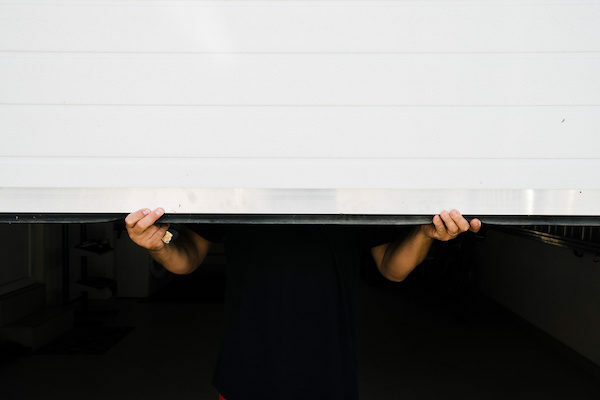 If you cannot lift the door easily, stop what you’re doing and immediately call your garage door technician as this is an indication of a problem. Now that your garage door is open you are free to move your car. To close your garage door and lock it you’ll need to be inside the garage. Simply pull the door down to the floor and secure the manual lock. Note that not all electric garage doors have manual lock features, which means you might not be able to lock it once you disengage the door. Even though you might now know how to manually open a garage door, you can still run into issues operating your garage door. Here at Premier Door Corp, we specialize in installing garage door openers and repairing garage doors for residential and commercial properties. To see how we can help you with your door, call us today!